So says the unnamed Ichiro lookalike character in Toshiki Okada’s God Bless Baseball, a play enjoying its North American premiere this weekend at Japan Society. The play itself is an allegory for the strained political relationship between Japan and Korea. 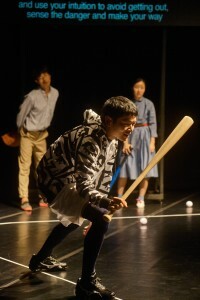 Okada’s concept for God Bless Baseball began in September 2015, when Seonghee Kim, director of the new Asian Arts Theatre in Gwangju, South Korea, asked him to create a new work for the theatre’s opening festival. In his first production working with non-Japanese-speaking actors, writer/director Okada uses baseball, which is wildly popular in both Japan and Korea, as the vehicle through which to address the two countries’ mutual animosity and to offer hope for change in the future. Yoon Jae Lee, Sung Hee Wi, and Aoi Nozu. © Asian Arts Theatre (Moon So Young). 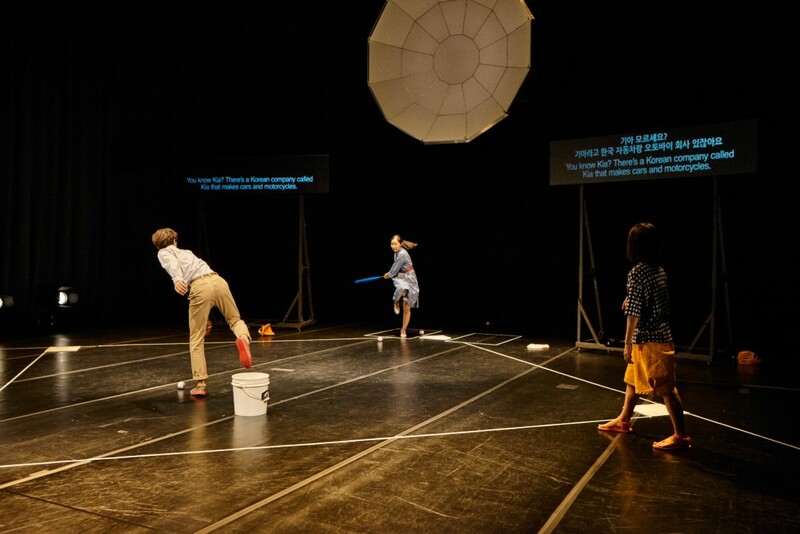 Set on a baseball diamond, two women – one speaking in Korean, the other in Japanese – both express their confusion about the rules of the game. A man joins them and tries in vain to explain America’s pastime to them before admitting that he actually doesn’t like baseball, either. It is at this point the audience and the other characters realize that, although he is speaking in Korean, he is portraying a Japanese character. His father was a big fan of the Yomiuri Giants; his wife favors the Yakult Swallows and longs to see a game at Meiji Jingu Stadium. In a similar twist, the Japanese-speaking character reveals that she is Korean when she expresses her anger about Japan winning the inaugural World Baseball Classic in 2006 and what Ichiro Suzuki allegedly said about the Korean national team. The Ichiro lookalike calmly yet sternly corrects her, emphasizing that he never mentioned Korea in his statement. “I want to win in a way that the opponent would think, ‘We cannot catch up with Japan for the coming 30 years,’” was what he actually said in the press conference, but media outlets misinterpreted him to mean the “opponent” was South Korea. The characters also bring up the merits of Chan-Ho Park and Hideo Nomo, the most successful Asian-born pitchers in Major League Baseball. Back-and-forth digs about which player was better show that Park and Nomo represent not only athletic ability, but also national pride. In the middle of it all, literally, is a giant white circle hanging behind home plate. As the women swing at and miss the baseballs pitched to them by the man, a booming American male voice calls each strike. This disembodied voice represents America, a calming influence between Japan and Korea, trying to keep the peace by agreeing with both sides. Yoon Jae Lee, Neji Pijin and Sung Hee Wi. © Asian Arts Theatre (Moon So Young). The Ichiro lookalike is America’s agent, doing the dirty work on the ground. He does a perfect imitation of the real Ichiro’s machinations at the plate, explains that the purpose of baseball – as in life – is all about returning home, and he leads the group in a thorough movement exercise. He even turns a bit sinister at the play’s end when the Korean-speaking woman tries to break free from the group. Ultimately, it’s Okada’s hope that Japan and Korea won’t “get” that there’s a difference, either, and there will be hope for the future of Japan-Korea relations. Toshiki Okada’s God Bless Baseball has two more performances at Japan Society, Saturday, January 16 at 7:30 p.m. and Sunday, January 17 at 2:30 p.m. To purchase tickets, please visit Japan Society’s website.